Progressive Care Inc. is a company which, through its subsidiaries Smart Medical Alliance, Inc. and PharmaCo, LLC, is a South Florida health services organization and provider of administration and practice management, utilization management, quality assurance, EHR Implementation, billing and coding, health practice risk management, prescription pharmaceuticals, compounded medications, the sale of anti-retroviral medications, medication therapy management (MTM), and the supply of prescription medications to long term care facilities. They claim that this company’s mission is to define a new level of service and healthcare which is based on the needs of patients and families. As stated, this is a Florida based company which claims to have been established in 2005 meaning this is a 13 years old company. 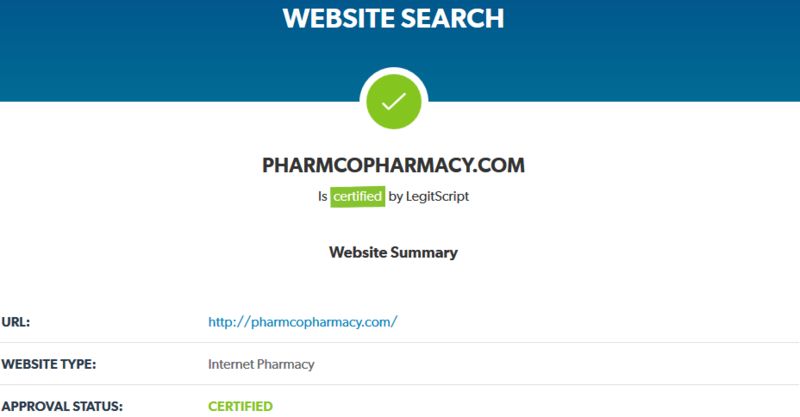 As much as it seems, this company is offering medications to their customers via their other company earlier mentioned owned by Progressive Care, Inc. named PharmaCo with the domain address Pharmacopharmacy.com. While searching for information on ProgressiveCareUS.com you can click a link in order to visit their pharmacy’s website. According to the information there, Pharmco provides prescription Pharmaceuticals, specializing in health practice risk management, compounded medications, the sale of anti-retroviral medications and related medication therapy management, and the supply of prescription medications to long term care facilities. Here’s a list of *what you can expect from PharmCo* according to information on their website: full service pharmacy, custom compounds, and specialty medications; cost containment; regulatory compliance monitoring; and unit dose packaging to adherence packaging. As much as they claim, the pharmacy is offering shipping to multiple states in USA, but they offering shipping only in USA and only in certain states. There’s a lot of information that people can read on their website and generally, this doesn’t look like an ordinary pharmacy. Through my review, I am going to try to find out if that’s good or not researching for information using both of their websites. According to the information on their website, PharmCo is a full service pharmacy meaning that they are keeping thousands of medications in their inventory, this inventory, as they claim, is including a wide variety of drugs for: diabetes, blood pressure, pain management medications, cholesterol and even premium, brand name pharmaceuticals for health issues such as: HIV/ AIDS, Hepatitis C, Cancer and many others. They claim that PharmCo is only using FDA approved or registered ingredients for making specialty medications and custom compounds. The problem is – I was not able to find a selection of medications on their website, there is no search bar function or a list of categories of medications you can choose from. They do claim to offer all those medications including others such as dermatology, wellness supplements and vitamins, hormone therapy, pediatric medicine and others. However I was not able to find a selection of medications. If you want to purchase anything from this online pharmacy you need to sign up and show off your prescription. Based on that prescription, you are going to receive your medication. I am not sure if they are able to fill any type of prescription needs. If you need a compound or specialty medication then you should contact them. In the end, my rate is 3 stars since they do claim to have thousands of medications for many health needs, but we can’t be sure that customers are going to be able to get here, for example, ED medications such as Viagra or Cialis, generics or branded medications. What attracts customers and what makes them make a decision about whether to purchase from a pharmacy or not is the prices. That’s the reason customers choose to go for online pharmacies as usually, the prices are better and cheaper. We can’t be sure that the prices at this online pharmacy are affordable. They did have claimed that customers would get cost containment, however we can’t be sure about that. That’s because, as I said, the medications are not listed on none of their website as on ordinary online pharmacies. Since no medications with their prices are being listed on the site, how a customer can make a conclusion if ordering from this site is worth it or not? It seems you can only see the price only after sending your prescription and I honestly think that this is not a good way to attract customers. The administrators should re-think their marketing strategy to my opinion as this definitely won’t attract customers. It is as if I would be interested in a car and I wouldn’t be able to see its price until I send my full personal information to the car’s owner. At very least, the pharmacy should share an example of prices, but there’s nothing. We can’t make a conclusion about the prices affordability and that’s quite a big problem. Since Progressive Care doesn’t want to share the prices with their customers I am not able to rate them more than 1 point. If this company wants to attract more customers and have more trust, I would recommend them to share the prices for medications. According to the information on their website, for eligible patients, the company is offering free home delivery and 1 day shipping for Florida residents. However, they claim that they are also working with insurance plans that allow shipping services to a list of states that is shared on their map displayed on the site. With this being said, I earlier mentioned – this pharmacy is only offering shipping only to USA customers and only living in the states displayed in the screen above. Plus to that, it seems that customers do not have the opportunity to choose the shipping option. In fact, there does not seem to be any other information about the shipping policy on their website. They only claimed that only some customers only living in Florida might get 1 day free delivery but there’s absolutely no other information about what’s the shipping delivery time, shipping fee etc. for other states and other customers. They do not share how fast is the ordering procedure, no information whether they do offer tracking or anything else at all. An online pharmacy that is only shipping to a few states in USA, with extremely limited information about the shipping policies like shipping delivery times, fees and many other information that lacks, can’t get more than 1 point for the shipping options unit. This company seems to offer a lot of information on their website, much more compared to some other ordinary online pharmacies that I have seen, however that’s rather useless information that customers don’t really need. But on the other hand, information that customers might be really interested in – such information as shipping options or payment options, it misses. Except for the fact that this company hasn’t shared any information about shipping options, they also haven’t shared any information about what are the payment methods. They only claim that this company is accepting some insurance plans (without sharing which ones actually, they only claim that those insurance plans that allow shipping service to the states mentioned above). Except for the insurance plans, I have seen an icon on their website suggesting they are accepting Bitcoin as well. I honestly think that main information that a medications provider company should provide misses and that’s a really big problem. I can’t rate payment options with more than 2 points as accepting insurance plans and bitcoin is not enough. And either they do accept anything else other, I am not sure. The technical characteristics is another very important factor that many customers are paying attention to as there are few people out there ready to wait for whatever amount of time just for an website’s page to load. The page loading speed is an extremely important factor that I am paying attention to and I recommend everyone else to do the same. So, using the google page speed insights test I will try to determine their technical characteristics. However, as I said it earlier, this company seem to have multiple domain addresses: progressivecareus.com and pharmcopharmacy.com being the main ones. However I decided to check progressivecareus.com since this seem to be their *mother* company and website. So I checked this domain address and the results were not too satisfactory. That’s because the mobile version had a score of 54 out of 100 meaning it is average rated to the lower end near to *slow*. The desktop version is much better, scored with 97 out of 100 meaning that it is fast and people shouldn’t have too much problems with loading speed and overall technical status of this website. My overall rate for the technical characteristics if 4 out of 5 meaning customers shouldn’t have problems, however if this happens that should be expected. Many modern customers are arranging their orders online from a smartphone and purchasing medications from online pharmacies from mobile devices isn’t an exception either. That’s why I think that it is very important for any company to have a mobile version of their website. Using the Mobile-Friendly Test offered by Google Developers I found out that the test results came back positive as the page is mobile friendly meaning this page is easy to use on a mobile device. Although the pharmacy does offer a mobile version I discovered 2 problems when trying to access their site from my own smartphone: they are having page loading issues (we can see it mentioned on the above screen also remembering the previous unit I reviewed above) and plus to that, there is quite a lot of secondary information that shouldn’t be there for a mobile version of a site. For all the reasons I mentioned above, my rate is 3 stars for the mobile version. As much as we can see, the green lock is there meaning that the website is having a secure connection and it seems that every page is secured. The exact same thing goes for their other website. But there is still a problem – none of those domain addresses are sharing information about the owner meaning there is not a full transparency between the customer and the owner of the site. plus to that, I found out that their websites are not using the highest possible level of security – the 256 bit SSL encryption technology. They are only using the lower security level 128 bit SSL encryption. Taking all of this in consideration my rate is 3 stars. 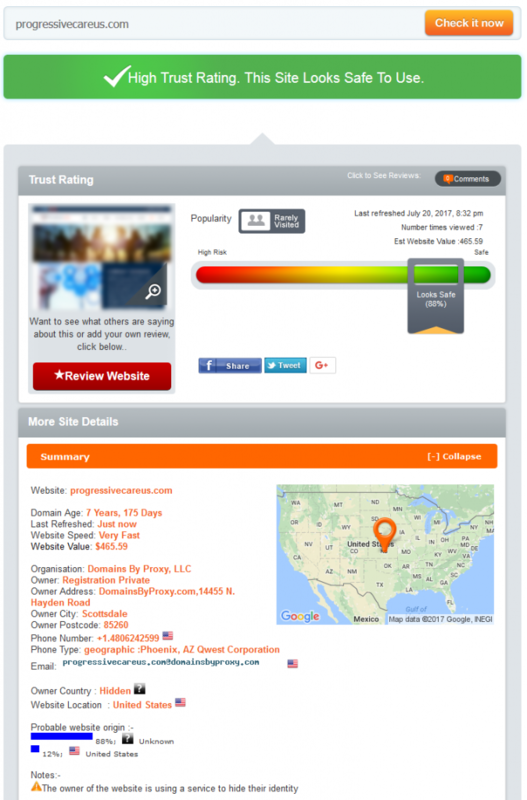 Unfortunately it seems that none of their websites, including the *mother website* progressivecareus.com is using an antivirus software. It is better to set an antivirus on your own gadget or computer because you risk with your personal information. There is a high risk of catching the viruses and other online threats if you don’t. Install the antivirus and ensure the absolute security from viruses on your own, as it seems that this company doesn’t really care about this. My mark for the lack of antivirus is 1 point. How to Make an Order at ProgressiveCareUS.com? Unfortunately, it seems that making an ordering is very time and energy consuming. Besides the fact that you should browse a lot through their pages until you find out that you can only arrange orders on their other website (you can’t order directly from progressivecareus.com), you also can’t order from their website unless you’re going to register on the site. Generally, you can’t order from this pharmacy nor see the ordering procedure or any other medications, prices or anything else unless you register and submit a script first. It is not only the problem that you can’t order, but you barely are given any meaningful information before you register and submit a script. There’s an option on the site to *get started* and clicking on it you’re redirected to their *Contacts* page. Although the company claims that managing the medications has never been easier, I’ve never seen any other pharmacy making it harder for customers to order their medications online. I honestly think that they should make it much less complicated as I find it to be really inconvenient to order anything from this site and since this creates discomfort to customers my rate is 1 point for this unit. Is ProgressiveCareUs.com Legit and Safe? Scamadviser.com has always been a really helpful website in determining the security and legitimacy of an online pharmacy, often discovering the darkest factors about an online pharmacy. This time was not an exception as scamadviser.com did discovered some interesting factors about progressivecareus.com. As much as can see in that screenshot, the site looks safe with a trust score of 88% which is not perfect, but fairly good. However, I discovered few problems: domain age is 7 years instead of 13 years as they claimed. Another problem, they share exact address on their site, why would they want to hide the website location? That’s because the site location, owner country, organization, owner and owner address are all hidden information. I honestly think that when the owner of a site is hiding their identity there’s a reason for that. These problems are not essential, but they are still there and are making me rate this unit with 3 stars. As I earlier said, this company doesn’t even share a list of medications – the customers can arrange orders only after sending the prescriptions and they would be sent the according medications based on their prescriptions. This means that customers without a prescription can’t even try to order online prescription drugs from this pharmacy. A serious approach of selling prescription drugs makes me rate them with a rate of 5 stars. Taking in consideration that this is a legitimate pharmacy my rate if 4 stars. It can’t be higher since no info is given on this for their *mother website*. The customer reviews are a great way to determine if the pharmacy is worth it or not, and that’s especially if we don’t know the prices as so many other essential information about a pharmacy. I checked for customer reviews on their websites but it seems the site administrators haven’t made it possible for the customers to write or read testimonials. I honestly think that this is a great way to attract customers, but as with the prices, site administrators don’t seem to care too much about this. I hope that I will find customer reviews on third party websites but for the testimonials on their own website my rate is 1 point. As I said I am going to try to find customer reviews on third party websites and unfortunately, I was only able to find customer reviews on their Facebook page. There does not seem to be any reviews anywhere else online, not on yelp or any other big reviewing websites. At least I did found some customer reviews which could help us make a conclusion. There are 22 reviews on Facebook and seemingly, most of them are positive which is a great thing. 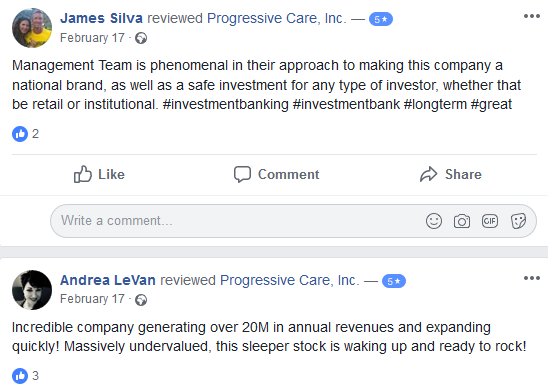 You can find people like James Silva or Andrea LeVan saying that the management team is phenomenal and it is a safe investment plus they claim to be an incredible company. But unfortunately, there are also people like Aruba or Chris N Megan Palmer who said negative things such as their stock are the worst that they have seen. Anyway, in the end, there seem to be enough customer reviews and most of them seem to be positive. For this reason my rate is going to be 4 stars. To be honest, I am quite sure that this is not enough, definitely not enough. I do think that the site administrators should do something and add other ways to save money if they want to attract customers. As for as much as I can see right now, my rate is 1 star. As much as it seems, both their contact pages on both websites are featuring a lot of different and helpful information. You can find the pharmacy’s or main office legal address, both located in Florida. You can check the phone number, the fax number, emails and even a map. You can also find the contact form and the hours they are open. I honestly think that the contact information is filled up completely and for this reason, I am going to rate them with 5 stars here. I have used the contact form to get in touch with them and the answer arrived shortly back to my email. I have asked them about coupon codes but they don’t seem to offer any. They did mentioned the 340B Drug Discount Program but that was something I didn’t really care about. In the end, I only paid attention to the fact the answer arrived shortly and responded in a professional manner. This is the reason why my rate is 5 stars. ProgressiveCareUs.com is a prescription provider company that owns Pharmco, Inc. pharmacy and Smart Medical Alliance, Inc. They are a company operating from Florida and offering shipping to limited number of US states. The company has a good customer support service and rather positive customer reviews on Facebook, high legitimacy on scamadviser.com and legit script as well as secured pages. But this company uses a low security level of their pages, no antivirus on the site, medium technical characteristics, especially for mobile version, it is super inconvenient to order anything from this online pharmacy and a lot of main information misses on their site. Biggest problems – lack of payment options info, lack of shipping policy and especially no prices are displayed on the site. Lastly, they have no coupon codes or any other ways to save money to attract customers.